Tall Mom on the RUN: Want a High Five?? I plan to revive HIGH FIVE FRIDAY tomorrow. I know that Mom vs. Marathon has BIG plans for a sub 2 hour Half at You Go Girl. Who else needs a HIGH FIVE for the Weekend? Comment here or on Tall Mom Facebook Page HERE. Be sure to Link your Blog if you have one. I'm pacing my brother for his VERY FIRST half marathon- The Air Force Marathon on Saturday. I PLACED FIRST IN MY AGE DIVISION IN MY THIRD EVER SPRINT TRIATHLON ON SATURDAY!!!! It was a tough event, being that it was on September 10th and it was a 4 mile un groomed trail run (which is unusual). Very tough....but I did it...placed first in my AG and was SECOND OVERALL FEMALE! I will be running my very first marathon at the Fox Cities Marathon this Sunday. Looking for all the high fives I can get! So excited!! I'm heading out on Saturday for my 5th straight weekend with a 20+ mile run after having only run that far once before! I need a high five. Since, I have a ten miler scheduled this weekend for a long run. I also didn't run at all during the week due to crazy schedule. I am the Iowa Chapter President of the Barefoot Runners Society and I have organized an meetup for Saturday morning. I get to be social with mellow cool people and take my family on a run at the lovely Grays Lake. Not a race but the whole "social" thing is always a challenge since I am kind of in charge... :) I am excited about it though! My 9-year-old Al and I are doing the YGG 10K again this Sunday! I am so excited to be able to do this with her again. Last year, this was her very first 10k ever. :o) I'm so proud of her! is my 20 mile run. The most I have done is 17.5 miles. I am way more nervous than I should be. I need to relax and just get it done. Thanks for all the inspiration you provide. I've completed the C25K program, lost five pounds, and am training faithfully for the Tufts 10K in October. Can I have a high-five? 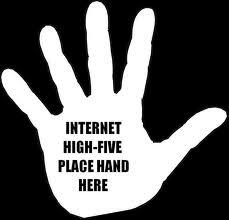 I'd give you a high-five for your totally inspiring blog! The Big Happy Family kids need a high five ... competing in a triathlon tomorrow at ages 7, 9, and 11. (300 yd swim, 2.5 mile bike, 1 mile run). So excited! Need a high five...running 18-miles on Saturday. It's been 5 years since my last marathon and I am questioning my sanity for wanting to do more!!! I raced the Ironman 70.3 World Championship in Las Vegas last Sunday. That's gotta' be high five worthy. Thus far, the week has been recovery, but I've got my 5k group to coach tomorrow and I might go for a run Sunday after work. Gotta' get ready for my very first marathon in October. I need a high five - I'm running my first race on Sunday, as part of a marathon relay -- I'm running the first 5 mile leg. I started running on June 1, battled some injuries, and I'm going to try my best to run at least half of the 5 miles! !